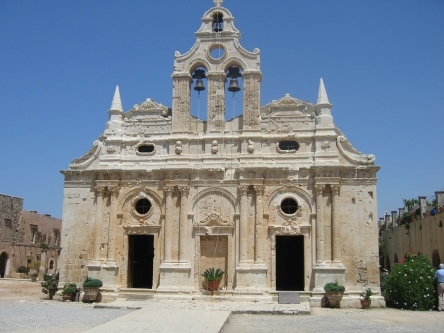 Standing proudly at the end of a steep, twisting road on the edge of the Psilorítis Mountains, not far from Rethymnon, the Arkadi Monastery (Moni Arkadhi in Greek) contains one of the finest Venetian churches on Crete. But its striking facade is not the only reason to visit. 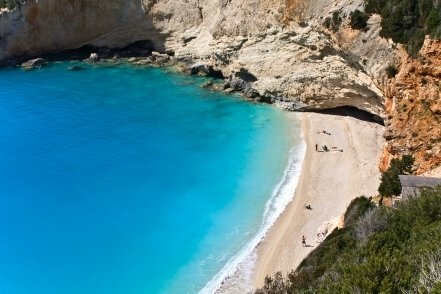 The tragic events that took place here in 1866 made it a national symbol of Crete’s heroic struggle for independence. The Arkadi Monastery is so important in Greek history that in pre-Euro days it was depicted on the old 100-drachmae note. 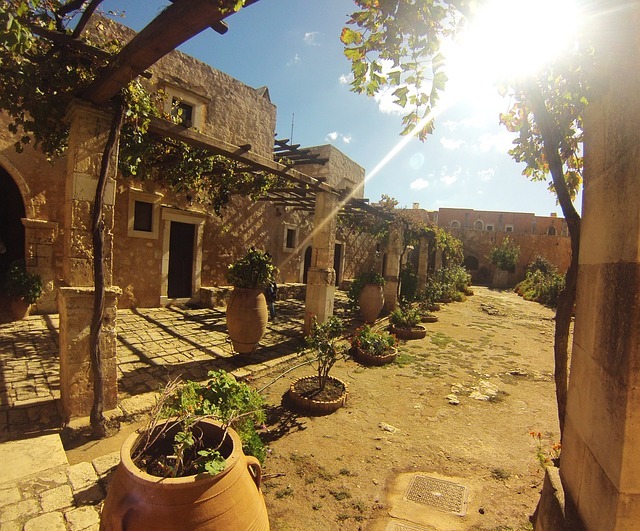 Though Arkadi’s origins date back to the 5th century, the present church was built in 1587, with the surrounding buildings added during the 1600s. 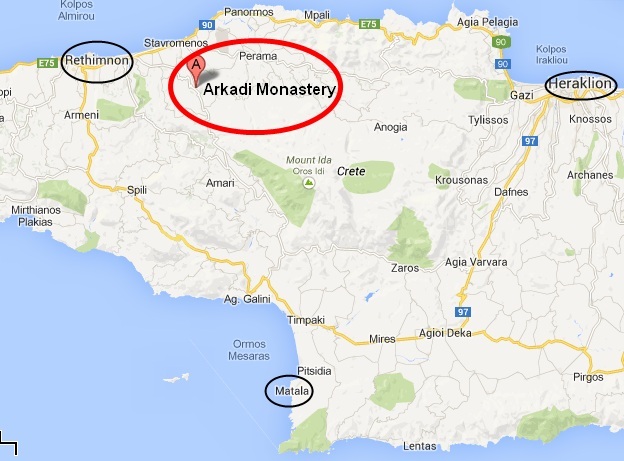 By the 19th century it had become one of the most prosperous monasteries on the island and was a centre of resistance against the Turks. During the 1866 rebellion, nearly 300 guerrilla fighters and some 700 women and children took refuge in the monastery. The Turks laid siege to it, and after three days broke through the gates on 9th November. As they rushed in the abbot ordered the ignition of the gunpowder stores, even though civilians were hiding inside. Hundreds of people, Cretans and Turks alike, were killed in the massive explosion. The angry Turks slaughtered most of the survivors. But this heroic act of sacrifice galvanised support for Cretan independence both at home and abroad. Take a close look at the crucifixes high on either side of the church’s altar screen. They both have ladders propped up against the cross and a skull and crossbones at the foot of each one. In the courtyard outside the refectory is an ancient cypress tree with a shell from the Turkish siege still embedded in its trunk. An arrow marks the spot. Although the Turks set fire to the Church, its lovely facade of golden stone survived. The two-nave edifice with its graceful bell tower stands in the centre of the courtyard. Inside is a beautifully carved altar screen of cypress wood, executed in 1902. On the right-hand side is a large gilt-framed icon of Christ, part of a scene of the Resurrection from the church’s original altar screen. To the left of the church is the Refectory, where 36 freedom fighters were massacred. You can still see sword marks on the long wooden table and benches. Above the refectory is a room with portraits of Cretan patriots throughout history. At the far left side of the courtyard you can step down into the roofless gunpowder magazine – formerly the monk’s wine cellar – where the holocaust took place. A simple shrine commemorates the tragedy. On the opposite side of the courtyard, the arched stone arcade over the old cloisters is very atmospheric. Above is a small museum which houses historic items from the monastery, including a fragment of the Sacred Banner and the battered old refectory door with visible bullet holes. The ossuary, housed in a former windmill outside the gate near the parking area, contains the skulls and bones of the people who died in the great explosion. If driving on towards Elevtherna note that the road is the one which appears to go through the monastery grounds. The signpost is at the far end. otherwise you will need a car. 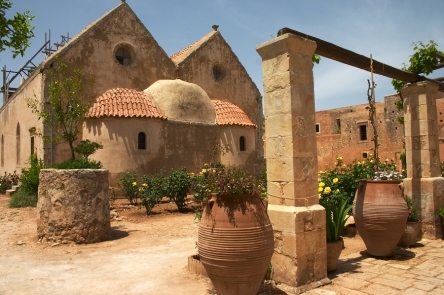 The monastery is about 18kms (11 miles) southeast of Rethymnon, and should take just under half an hour by car.